Today in an unexpected move, thousands of pro-government, pro-Mubarak people descended on Tahrir Square where thousands of anti-government, anti-Mubarak protestors have been for over a week. These pro-Mubarak protestors seem to have come to Tahrir Square looking for a fight (according to news reports from multiple sources on the ground, including CNN's Anderson Cooper who was himself attacked by pro-Mubarak people). 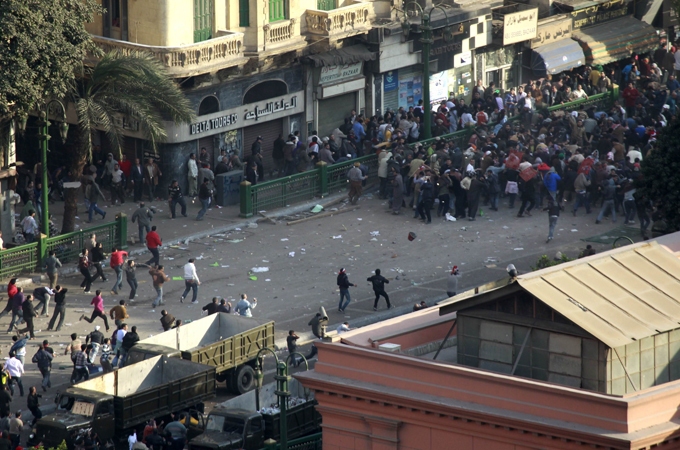 The picture above (from AlJazeera) shows pro-Mubarak supporters rushing anti-government protestors. There are many reports that the pro-Mubarak protestors have been sent to Tahrir Square by the government, as they were well-organized, well-armed, and simultaneously coordinated their surges in Cairo and Alexandria. The government, of course, denies any involvement, but they (Egyptian State TV) are also calling the pro-Mubarak protestors "pro-stability" demonstrators, clearly playing toward Mubarak's call for stability. Egyptian State TV says that 403 are injured and one person has died. Reports from the ground, though claim that the real numbers are much high, with one medical tent in the square already saying they have seen 3 dead. The situation now seems that it will only get worse before it gets better. Many people, both those who support and oppose Mubarak, will die, many more will be injured, unless their is intervention to protect the protestors, which the army seems unwilling to do right now (the police are already out of the question, they are clearly Mubarak supporters). It's hard to put into words my hopes and prayers for this situation, but suffice it to say that I pray for peace. To be sure, that may seem a naive hope and prayer, but it is all I can do. If you're interested in the ongoing situation in Egypt follow my twitter feed or AlJazeera English's live feed.